KEY FEATURES: Erect shrub to 3m, common in hedges. LEAVES opposite, oval, to 20x10cm; dark purple to purple-green with/without pink blotches, or green and pale green with cream sections, or green with yellow veins. FLOWERS terminal clusters, narrow tube to 12mm; 25mmm Ø; flat-face of 5 lobes with 2 fused together; lobes white to pink, with magenta spots. SIMILAR SPECIES: See under Graptophyllum pictum. IDENTIFICATION: Erect shrub to 3m with variable leaves, common in hedges. 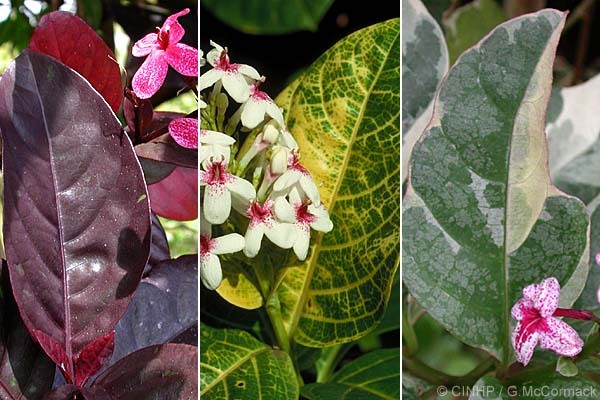 LEAVES opposite, oval, to 20x10cm; dark purple to purple-green with/without pink blotches, or green and pale green with cream sections, or green with yellow veins. FLOWERS terminal clusters, narrow tube to 12mm; 25mmØ; flat-face of 5 lobes with 2 fused together; lobes white to pink, with dark magenta spots.